Moong Dal Cheela loaded with nutrients, makes for a great breakfast . It’s superhealthy and light on the stomach. Morever, it can be even made with moong dal flour. Hence, can be made in a jiffy without requiring to soak moong dal, grinding etc. You can even stuff the cheela with the stuffing of your choice. For eg. paneer, spinach mixture. Here I have soaked the moong dal and have blended it to a paste. Feel free to use the moong dal flour to make the cheela. 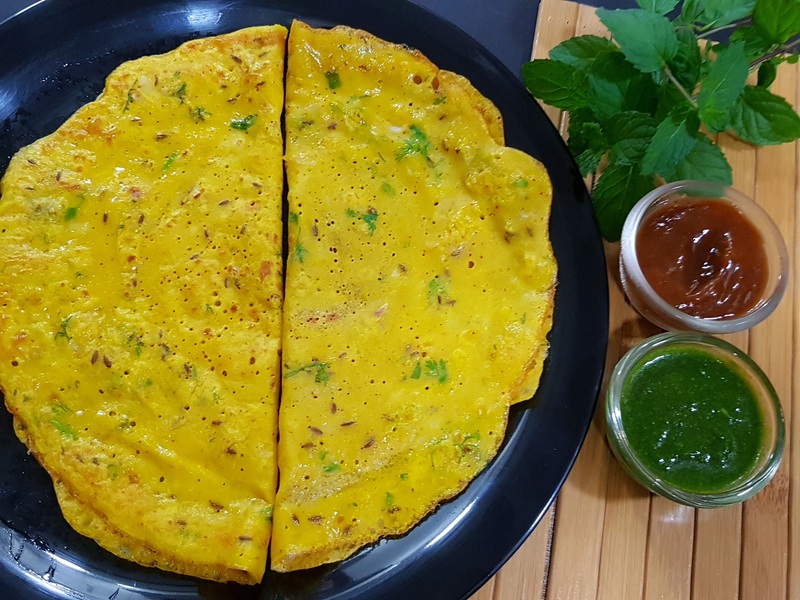 If using moong dal flour, you have to mix the moong dal flour with the other ingredients mentioned hereunder and add water to make a batter and then proceed to make the cheela. Soak moong dal in water for 3 to 4 hours or overnight. Strain and grind alongwith chillies and ginger to a fine paste. In a mixing bowl, mix the ground moong dal, chopped onions, cumin seeds, red chilli powder, turmeric powder, chopped coriander leaves, hing and salt. Add little water to make it to a flowing consistency. Pour a ladleful of batter and spread it into a circular shape. Drizzle little ghee around the edges and cook on both the sides. Serve hot with chutney and tomato ketchup.